You will be charged a deposit equal for 50 % of the total stay, but not less then the first night payment within a week from the booking. if you decide to cancel 4 weeks or less prior to arrival, we keep the deposit. If you will not show up without, we keep 100% of payment. We may ask you to complete full payment(up to 100%) within a week to arrival if the booking is made for a high season especially weekend or large events.This deposid will be nonrefundable. The same policy for the reduction respectivelly to the percentage of the reduction and the total amount. Group booking must be confrmed by a hostel manager. key deposit : 30PLN/7EUR/passport per every dorm key that you want to use. Both deposits are fully refundable at check out assuming that no damage is caused and no key is lost. If the group as a whole or particular member due to improper behaviour is asked to leave a hostel no refund is given. Welcome Oki Doki City Hostel Warsaw. 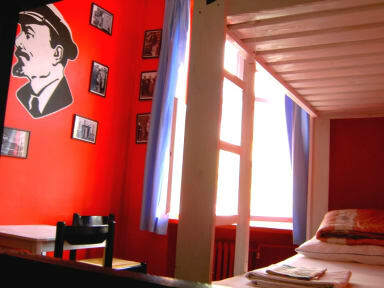 Socialize with the best comrades in communist room, relax in house of birch, dream about blue sky in 7th heaven. Our private doubles could beat those you find in most of the boutique hotels. 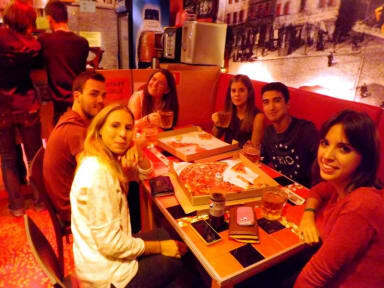 We organise different activities every day, Pub crawls, tours, pierogi cooking lessons and more. Have lots of fun and a glass or two of polish traditional beer in our bar, you will not find it cheaper anywhere else in Warsaw- during HAPPY HOUR we serve one big beer for 6 pln(1,2 EURO)! Get a bit lazy with our location - we are in the middle of everything: 12 min walk to main railway station and up to 15 min walk to the old town. We are exactly half way between both of them. Get fit climbing to our reception ;) we are on a 2nd floor of a monumental building, which during a communism time served as a a part of ministry of agriculture. Ask our staff about anything that interests you- we are young, we are bright, we know a lot about history of Warsaw as well as about the best party venues. Check how is it when a passion becomes a way of living- Oki Doki City Hostel is owned by a family of a keen and experiences backpackers. Mingle with other guests - they range from teen aged to veteran backpackers; every year we host artists and festival participants such as story tellers, singers, mimes, musicians and movie makers. What is ours is yours! You are our guest from the time you pass the entrance until you leave- please fell free to use all our facilities any time you like. If you arrive ahead if check in time which is 3 pm or want to leave after check out time which is 11 am please stay in one of our common areas, having cup of coffee, taking shower or using internet. Note, it is strictly prohibited to smoke, drink alcohol and eat inside all the dorms. For reservations for more than 8 people or 4 rooms, please use group reservation button. Reservations for 8 people / 4 rooms or more attempted to be made online could be considered as not guaranteed. There might be additional requirements for group bookings (including 4 male only parties). Отличный хостел европейского формата! Приветливый персонал, готовый помочь в любую минуту, удобные места для сна. В описании стояло, что полотенце включено, но на ресепшне за него попросили дополнительную плату. Мелочь, а неприятно.